Another popular stand at the Anti-Ageing Beauty Show, as well as Jamela, was the one showcasing the CACI Microlift Personal Facial Toning System. The CACI Non-Surgical Facials available in salons are already well-known, but this is a little gadget that enables you to do similar facials at home. Louisa Noel-Johnson from CACI used the Toning Programme to lift my outer eyebrow area and I’ve got to admit it, the results were immediate. Microcurrent therapy was originally developed for medical use, to treat patients with facial palsy by restoring tone to the affected muscles. CACI facial works in the same way to stimulate muscles to lift, firm and tone. I’m trialling the Microlift for one month, starting today. The CACI Microlift emits low-frequency, micro current impulses that work in harmony with the body’s bio-electrical field. – Nope, no idea either, but we know the salon treatments do work and it’s non-invasive. The device is not recommended for use if you’ve had Botox or Dermal Fillers, in case it shifts the substances around underneath your skin. The Microlift will come with 100 Electro Buds – Unique serum filled cotton buds that have been specifically developed for use with CACI facial toning technology. Refills are around £35.00 for 100 serum filled buds, but maybe good quality ear buds dipped into your favourite anti-ageing serum (and always kept moist) will work just as well after you’ve used up all the original buds? This device is an ongoing commitment, 12 initial treatments, 3 times a week, with a day off in between. Then maintenance twice a week or whatever you find works best for you. The Toning programme (5 minutes) is designed to help firm the jaw line, plump the cheek area and lift the brow line. The Wrinkles programme (5 minutes) helps to soften the appearance of fine lines and improve skin texture to give a more youthful looking complexion. There’s an on-screen timer for 5 minutes per treatment programme, but expect it to take a lot longer the first couple of times you use it. Remember not to drag the skin and keep the pressure ‘light’ as long as you hear the beeps, then it means all four buds are in contact with your skin and it’s working efficiently. The first charge will take about 3-5 hours, the device is lightweight and comfortable to hold. Selecting programmes is foolproof, it’s just a matter of toggling between ‘Toning’ and ‘Wrinkles’ and selecting the frequency, never ‘High’ around the delicate eye area though. Keep a shallow bowl of water nearby so you can moisten the buds quickly when they dry out. Download an illustration of facial muscles, we all have the same muscle structure underneath. It’s essential to take the time to figure out the exact placement points to stimulate the right muscles, otherwise you’re just wasting your money by prodding haphazardly. Follow the official CACI videos on You Tube. They are easy to pause so you can perform the actions in real-time. Before first use, cut the ends off 4 cotton wool ears buds, insert them into the device (but don’t turn it on) and have a bit of a practice. 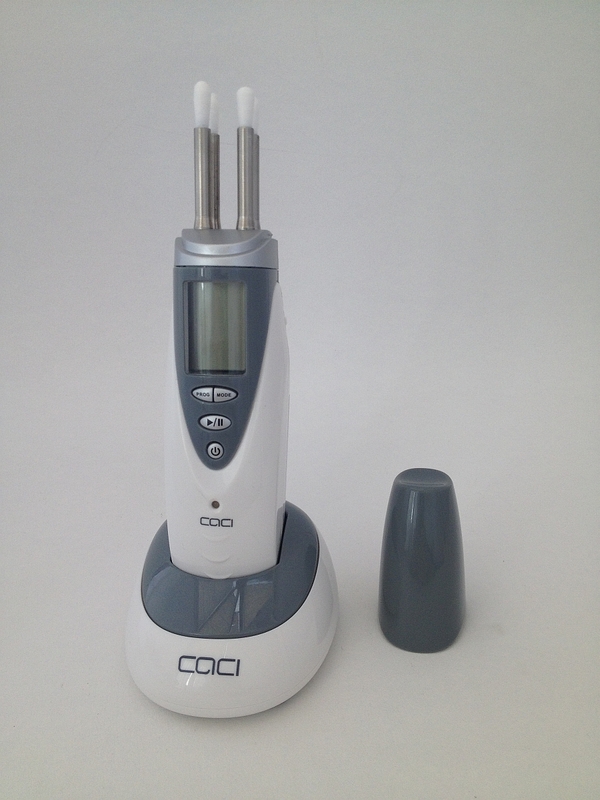 CACI sends out tiny electrical impulses which are transmitted to the facial muscles using soft cotton-tipped wands. Does it work? Did you notice an improvement? I was going to go to a salon to have something similar done – 10 sessions of facial muscle training. So I’m very interested to hear your opinion. I’ll post a full review on Tuesday, but I think 10 CACI salon treatments is a very good idea!